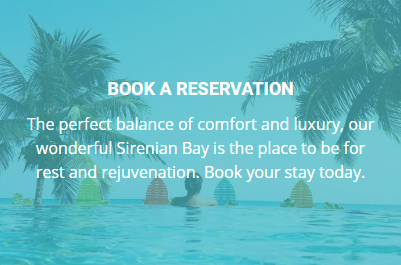 Here at Sirenian Bay the land-lubbers have been spending their days exploring the one-of-a-kind experiences our peninsula has to offer, and they’ve found plenty of great places to share. The getaway was a last-minute idea, and the our family arrived without having booked accommodations – but with their fingers crossed that something would be available. The island manager greeted our group as we arrived, and encouraged us to settle in with a cool drink at the bar before touring the picturesque island. Having cooled down with a cocktail, the we explored the red brick path that took us around the island – and its impeccable landscaping and acommodations. One settled in, we explored the rest of the island and its activities – which included volleyball court, paddle boarding, kayaking, pedal boating and snorkeling. We returned from our snorkelling expedition to enjoy a huge lunch, some great cocktails and lounging about in the hammocks, chairs, and beds stationed on the beach. A dip in the freshwater pool offered a handy post-meal pick-me-up. The evening brought a volleyball challenge, with the game drawing a crowd of guests from all around the island. “Other guests joined in, and when we saw the staff looking on, we knew another challenge was coming: staff versus guests!” says Brian. With victory declared, everyone wound down with a pre-dinner sunset walk around the island. Some strolled along the pier, some expored the beach, and others simply enjoyed the view from the front porch of their cabana. The group was also happy to learn that there was no island access fee at the resort: you only paid for food, drinks and any accommodations used. Considering an island getaway as part of your visit? Take a closer look at Hatchet Caye.